Kizawa Tunnel underwent a rare pattern of deformation in the October 23rd 2004 Mid-Niigata Prefecture Earthquake in Japan. Two parallel pairs of diagonal cracks of its concrete lining appeared near the north mouth of the 300m-long road tunnel. 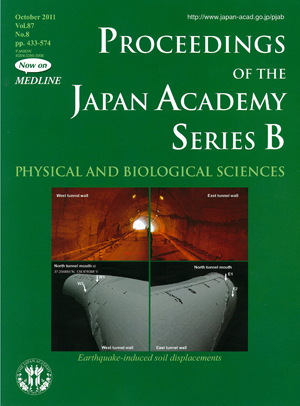 The cover illustration of this issue shows, on its upper half, photos of the cracked west (left) and east (right) tunnel walls and the laser-scanned images of these walls below them. The upper west (W1) and lower east (E2) cracks were folded inside the tunnel, while the lower west (W2) and upper east (E1) cracks were folded backwards. These axially opposite pairs of zigzag folds allowed the tunnel crown at this location to shift about 0.5m sideways with respect to the tunnel invert, indicating the presence of a large hidden shear plane cutting the tunnel in the interior of the surrounding sedimentary rocks. The present paper (pp. 433 to 449) in this issue highlights the importance of keeping careful and continuous eyes on the landforms, which can change all at once in a big earthquake, and furthermore keep changing slowly even after the earthquake. A challenging attempt was made in this paper to extract Lagrangian displacements of soils and rocks from the Eulerian displacements observed through remote-sensing technologies. It is worth mentioning that the extracted information was actually reflected in the successful rehabilitation measures in areas affected by the Mid-Niigata Prefecture Earthquake.